•	40% water reduction with new dual-flush toilets, waterless urinals, and low flow showers and sinks. •	90% of the building is reused, keeping down costs and reducing environmental impact. •	Ground source heat pumps/geothermal are used, which are 44% more efficient than air-cooled pumps. 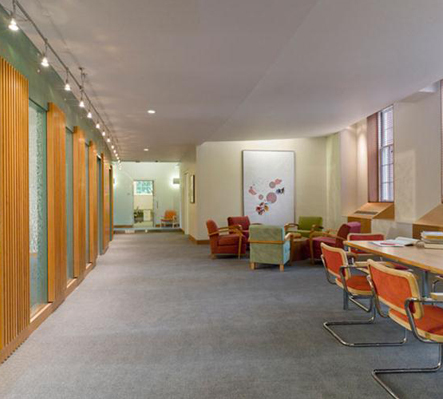 The 42,000 square foot Byerly Hall renovation includes offices, commons areas, and studios for the Fellows of the Radcliffe Institute for Advanced Study. This three-story building has undergone a complete renovation to accommodate the new requirements for the building use. The ground floor is open to include more public spaces including lounges and meeting rooms. Elevators and entry ramps were renovated to comply with code standards and allow for a more universally accessible facility. The project used LEED for New Construction, version 2.2 to guide and certify green design elements. 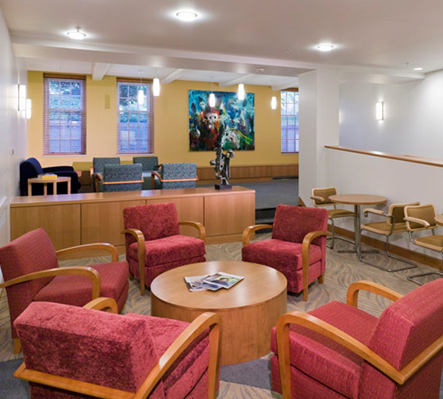 The Gold certification is a testament to the commitment of the Radcliffe Institute and the design team.